“Duke McConnell was one of life’s characters.” That was how Rev Dave Whiteman began his eulogy to the man who was born David McConnell. Mr Whiteman continued, “But nobody new him as David. I remember one night in the Speakers Club when someone phoned for David McConnell and no one knew who he was. Ah, Duke – yes, he’s here.” He was called Duke after his uncle, it was a family name, and also because he duked the ball when he played football. Duke would have been 83 next month, and today would have been Mae and Duke’s wedding anniversary. Duke was born on the 23rd October 1923 the only son of Elisabeth and Thomas McConnell. He left school at the age of 14 and went to work with his father as a trainee painter and decorator. Now, the story goes that duke lasted one day in the job,. he spilled a pot of paint over an expensive carpet and that was that - they mutually agreed it was his last day. Duke served his time as a plumber before joining the army, and served his country during then war in the artillery in Egypt and he was proud to have landed on the beaches three days after D-day. After leaving the army Duke worked in Ayr as a plumber joining Callaghan’s, and it was there that he met a young girl who worked in the office. Love blossomed and they were married 39 years ago today. 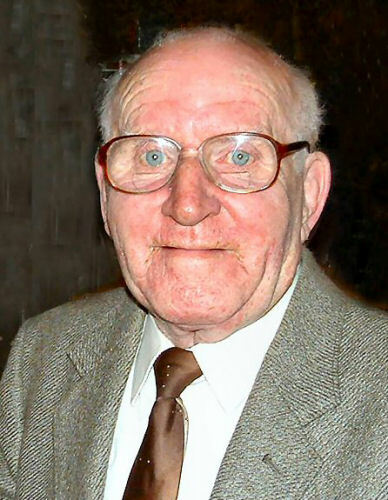 They moved into Maybole and he was 25 years at Callaghan’s then with Alistair Johnstone and latterly Duke worked for himself until retiring at the age of 70. Well he never really retired! What of Duke’s interests? Well, his family and socialising - that was about it. Duke was a very sociable person, and he helped at the club occasionally, He enjoyed the caravan at Sandhead from 1976 to 2002. He loved the social life there; he had many good friends at the caravan site and he enjoyed fixing things, helping other folk with their caravans. Part of his work was looking after the caravans at Redgates and he really enjoyed that. Duke in his younger days read westerns, he loved westerns, and he played snooker at the camp site club. I don’t know if anyone noticed but Duke used to talk to himself when he was working - and he used to get an answer at times. Duke was very much a man’s man; he enjoyed his blether, he enjoyed company, latterly he stood at the gate and blethered with those passing by. Duke was very sociable, he liked a joke and a carry on, he enjoyed his Guinness at the Grey Man or the club, I enjoyed many a drink at the club with Duke over the years and he was good company. Duke never ever judged anyone and he treated everyone the same, he never had a bad word to say about anyone. Live and let live was his motto. He used to say, “You only pass this way but once.” In other words, you have one chance in life. Duke was a funny man, he had a wicked sense of humour, dry at times; he enjoyed life very much and he just idolised his family. His work really was his hobby because he loved helping people. Duke loved to help people he was a wee man with a huge personality. Duke enjoyed good health most of his life but towards the end he took it hard because he couldn’t get out. How do we sum up Duke’s life? Well, he was one of life’s characters; life was never dull with Duke. He will be sadly missed.”Duke is survived by his wife Mae, daughter Gaynor, son-in-law John, and his grandsons Ryan, Grant, Kyle, and Ross.